have a look at the attached screenshot. Does this help? 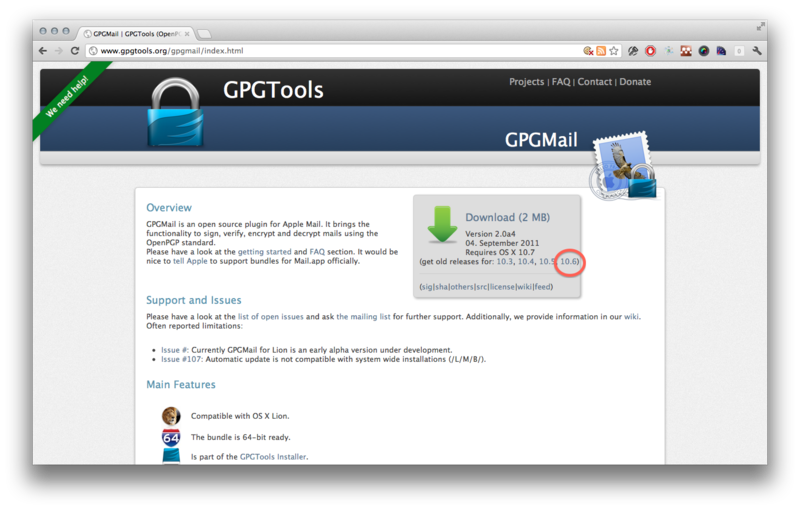 Alternatively just get our installer - it also contains GPGMail for 10.6 too. Hi Alex. That didn't work...I get the message I'd mentioned earlier, which is that its compatible with Lion only. See my screen shot for the error message I get. Hi Christie, I just downloaded GPGMail-1.3.3.dmg (see my screenshot) and installed it under 10.6.8. Are you really, really, really sure that you've downloaded version 1.3.3? Hey Christie, closing this for now. If you have any questions or issues setting this up correctly please re-open this discussion and we'll be happy to get you setup. Steve closed this discussion on 26 Nov, 2011 06:38 PM.